December 8, 2004 proved to be a very sad day. My Mom came running over to the house to tell me that Munchkin had died. She became sick on Tuesday evening; lethargic, a little vomiting and diarrhea. Sam had went to look at her, and was relieved her gums were pink (Autoimmune Hemolytic Anemia had struck Munchkin on 2 other occasions, ending her career in the program). It was decided that Sam would bring some fluids home after work on Wednesday evening, and in the meantime, Munchkin began an antibiotic, and a medicine to help diarrhea and vomiting. My parents thought that Munchkin felt a little better on Wednesday morning, but realized she was still sick. They left to go Christmas Shopping, and when they arrived at home a few hours later, Munchkin had died. This is a HUGE loss to our group, as Munchkin was the inspiration for this program. I can only imagine what it is like for my parents, who loved and cared for her everyday. When we lost Munchkin this week, no doubt we lost an angel on earth. 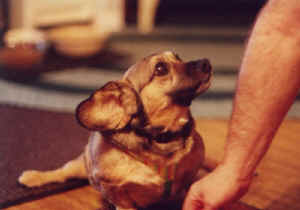 We used to always joke with my Dad that no one was going to visit with Munchkin because no one would pay any attention to any of the other dogs, and that was true. We would joke that we were all going home to make wheelchairs for our dogs so they could get some attention. 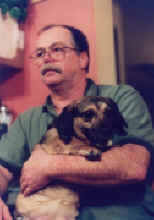 My Dad would eat this up…knowing full well he had a very special dog. A dog that had the ability to reach beyond the social stigmas and ranks of misfits and simply love everyone. Munchkin had a special gift to give to people. A gift of even more understanding than our other animals can give to some of our patients. She was in a wheel-chair. She knew trials and tribulations of life. She accepted them, moved on, and even thrived in her situation. She stood up and told the world “What is normal? We are all only limited by our own attitudes and ideas.” And Munchkin didn’t realize she was handicapped. She didn’t lay around, she persevered. She didn’t feel sorry for herself, she continued on doing what she did best. She lived a full happy life. Her care was more involved than most animals. I recall when my parents picked Munchkin up. Just a few weeks prior, my parents lost their little black poodle named Chester. He had been a 3 legged dog, and my parents loved the fact that they were able to help a dog that probably wouldn’t have found a home any other way. When Chester died, my parents were devastated. They didn’t want to leave the house, they just sat for days on end in the kitchen reminiscing about him. It was horrible. Finally I met Munchkin at Animal Charity, compliments of my friend Peggy Headrick. My parents went to look at her, and brought her home. I remember me and both of my brothers waiting at home for them to bring Munchkin home that day. My parents came back to life, and loved that little dog so much. Munchkin healed a part of my parents, just as she would prove to do with so many through the next years. 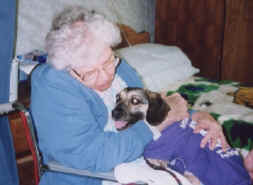 Munchkin had been visiting at nursing homes while living at Animal Charity. Part of the contract my parents signed when adopting her promised to continue visits to nursing homes and hospitals. Stories were everywhere about how Munchkin had inspired people to talk that hadn't spoken in years. 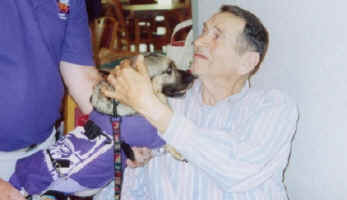 It was inspiring to me to realize the power of animals, and so, K-9’s for Compassion was born. To realize that our inspiration for this program has died is a profoundly sad, upsetting fact for me. Certainly she will be missed. Certainly she will be remembered forever, and has earned her place in K-9’s hall of fame. It will be frequently that I tell her story, and may all of us tell the story of how we came to be…and how Munchkin was the shining light that will continue to watch down upon us, and encourage us to continue our visiting. She will be encouraging our animals to heal and inspire. My wish in this sad hour is that each of us go to our facility this next week with our animals, and don’t rush, but relax and enjoy. Listen to the stories, even if you have heard them a million times. Reach for the emotion that is there. Hear people when they smile, when they thank us. Realize with every room that we are making a difference. That time is ticking, and our animals and the people that we are visiting are gifts from God. May we all realize that we are blessed with wonderful animals who have a gift, and that we find the courage to give freely of that gift. May we all remember Munchkin in our hearts forever. As I sit in the kitchen drinking my coffee, I glance at the French door with the glass that goes all the way to the floor. I am instantly reminded of when we brought Munchkin home. 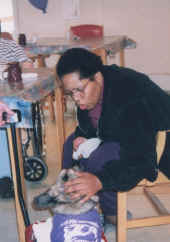 She was so full of life; she would drag herself after my wife, Kathy, while she was running the sweeper. She would run as fast as she could to the door whenever someone came to the house. One day we noticed that she was looking out the back French doors at a stray cat that made a home on our back porch. We named him P.C. for Porch Cat. One day the cat was walking across the back yard, so I put Munchkins wheelchair on and set her on the ground outside of the back door. She was gone like a flash, running as fast as she could go. When I called her name she would stop and come back to the house. After doing this a number of times, P.C. just stopped running. Munchkin ran to him, they smelled one another for a little while and Munchkin turned and walked back to the house. P.C. followed a couple of steps behind. We came to find out that while Munchkin was at Animal Charity for 3 years, she had made friends with a cat there and they stayed with one another all the time. This is one of the stories that I would tell when we would visit. She was such a gentle soul. I remember the way she would push back against the person she was having a bed visit with. Almost as if to say “Thank you for letting me near you.” As I struggle to find the words to say how I feel about this little dog that was run over and left for dead on a Youngstown freeway, a visit to Tod Children’s hospital comes to mind. After visiting the hospital for a while Munchkin and I were ask to visit the Spina Bifida Clinic. I remember we were nervous because we were the only team asked to go. As we walked into the waiting room on the first day, the children were all saying things to and about Munchkin. As we walked towards them Munch was pulling on the leash, and you could hear one voice over all of the rest: “Oh Mom!” At the same time Munchkin pulled past the rest of the children and stopped in front of this little girls’ wheelchair. This was a 10 or 11 year old girl who had never walked in her life. She said “Mom, can I pet her?” As I picked her up so the little girl could pet her, I heard her say “It’s OK. I’m special too”. I think that is the way to say it, Munchkin you were very special!!! In closing let me thank the Lord for choosing me to be the one to hold her leash on an incredible journey. Munchkin, I love you. Dad. Last updated: January 30, 2006.